The Wings’ away woes continued on Saturday as they returned from South London empty-handed. Welling started very brightly but it was Dulwich who had the first chance with Akinyemi firing wide after breaking through. Welling’s best early chance fell to Brendan Kiernan after a some classic Danny Mills hold-up play left him with only Edwards to beat. Kiernan applied the finish but Edwards got a slight hand to it and sent the all out for a corner. Shortly after the hosts took the lead after Nathan Green was sent through by Thompson before bending a powerful shot in to the bottom corner past Dan Wilks. Gavin McCallum looped a header on to the top of the net as the Wings tried to convert their possession in to chances. 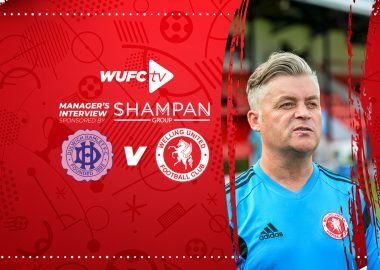 Welling changed system at half time, starting the half in a 4-4-2 and again started brightly with a Danny Mills shot deflected wide by ex-Wing Michael Chambers. The game’s major talking point game soon after substitute Jack Barham got in behind the Dulwich defence, only for Edwards to come out and clearly handle outside the box. With the whole stadium expecting a red card it was a great surprise when the referee reached for his pocket and raised only a yellow card. Wilks had to be at the top of his game with a gravity-defying save to keep Welling in the game. Jordan Gibbons half-cleared a Thompson cross but only as far as Akinyemi, whose sweetly-struck pile-driver looked to arrow into the top corner only for a stretching Dan Wilks to get a powerful hand to it and tip over. It was 2-0 shortly after Onovwigun found Decarrey Sheriff who finished low past Wilks. The Wings pulled one back after Bradley Goldberg wriggled clear. Edwards made a good save but the ball cannoned back off Chambers and rolled into the net. 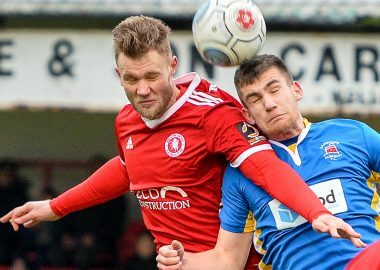 Five additional minutes were played but Welling’s effort fizzled out and the whistle blew on another away-day defeat.